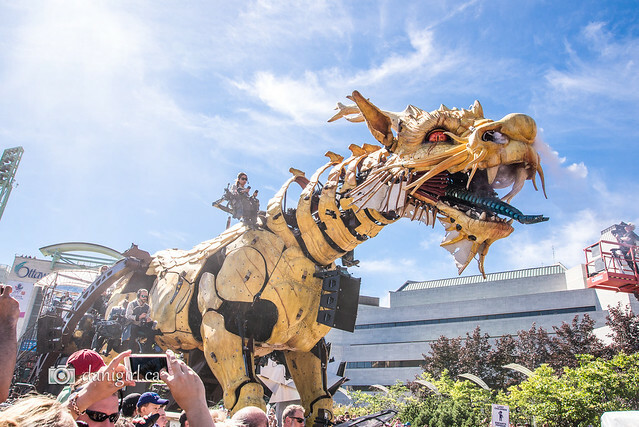 It isn’t every day that one gets to see a giant spider and a three-story tall dragon performed street theatre on busy Ottawa streets. 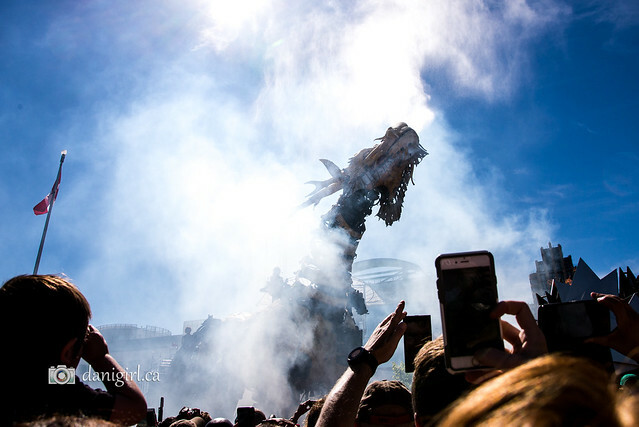 I was curious to see La Machine, the unique street theatre presentation featuring a giant mechanical spider and a steam-and-fire breathing horse-dragon, but was leery of the crowds. 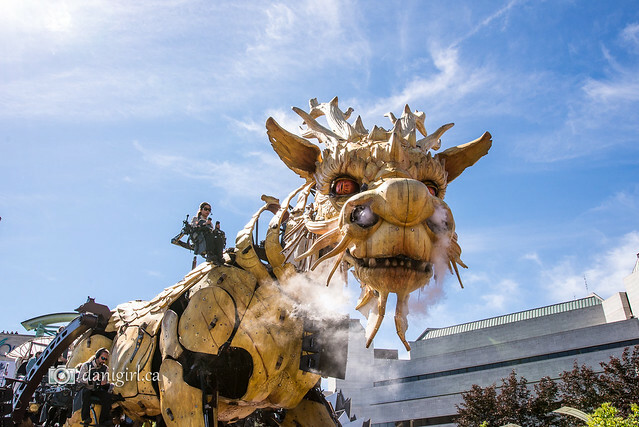 In the end, we decided to go as a family to see Long Ma, the giant horse-dragon, “awaken” at City Hall this morning. This was the scene when we arrived: Long Ma sleeping in front of Ottawa City Hall. It didn’t take long for Long Ma to awaken and start moving, and then to start breathing fire and steam. And then, to our surprised delight, it started moving – right toward us! Long Ma rolled off down Laurier and then Elgin streets, in search of Kumo the giant spider. So. Many. People. 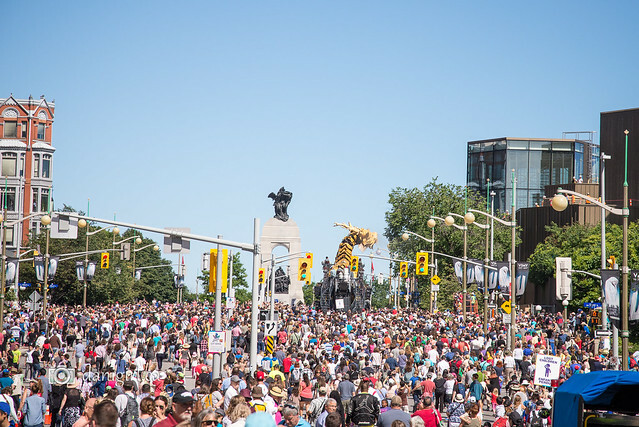 It was truly extraordinary, and worth braving the downtown crowds to see it – although I’m not sure I’ll be able to entice the family downtown to go in search of Kumo the spider. I’d love to see their final “battle” on Sunday but I fear half the city will be there. 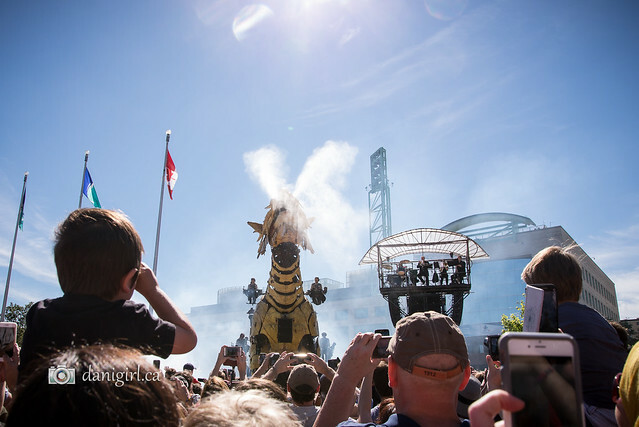 If you’re curious, you can read the back story behind the event on the La Machine page on the Ottawa 2017 site. The gist of it is that Kumo has stolen Long Ma’s wings, and has been disturbed from her rest by the underground work on the LRT downtown, and now Long Ma roams the city in search of them. If you do go, I’d suggest bringing water bottles and sunscreen, a decent camera and a bucketload of patience. We were downtown at least an hour early, parked four blocks away, and the crowds were still intense – but at least good-natured. I think it will only get more crazy as the weekend goes on. There are also a few more photos on Mothership Photography’s facebook page. 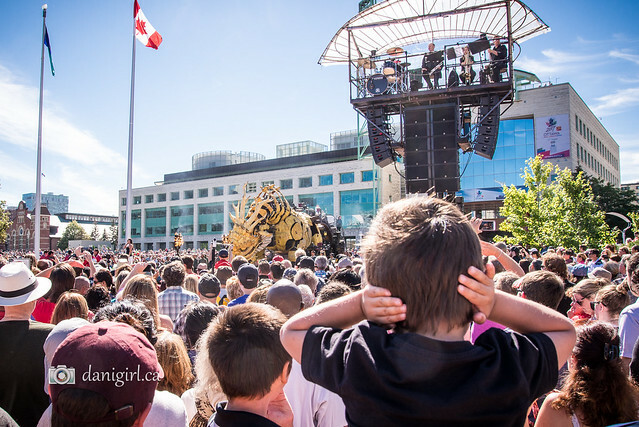 Have you been downtown to see Kumo and Long Ma? What did you think?